If you’ve read my second book, Teatime in Paris, you will have discovered not just easy French teatime goûter recipes, but also the sweeter addresses in Paris – plus some fascinating titbits of history that accompany many of the pastries. With such a wealth of the best sweet addresses in Paris, imagine how exciting it is to have the most delicious oasis of patisseries, bakeries, chocolate and caramel shops plus Salon de Thé tearooms concentrated IN JUST THREE BLOCKS, all near the Eiffel Tower! What’s more, there are now two new delicious arrivals on the block! 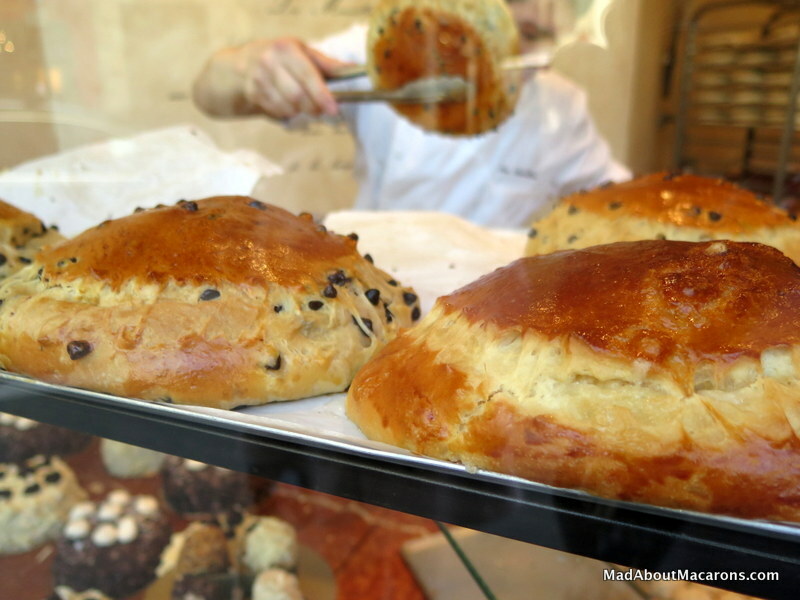 Let me be your online guide to the best pastries on Rue Saint-Dominique – starting at the bottom of the foodie pedestrian street of Rue Cler in the 7th Arrondissement, to the Esplanade des Invalides, an open-air playground for the boules-playing locals. Finish off your sweet stroll by watching them play, or grab a bench in the quieter little parks around it with a pastry box or two and caramels in hand. Right on the corner of the Church of Saint-Pierre du Gros Caillou, marvel at the Merveilleux meringue-and-Chantilly-cream domes freshly being prepared in the window. It’s not difficult to be lured in, door wide open, to this chandelier-lit bakery, where Frédéric Vaucamp has brought back the 18th century specialities of Northern France and Flanders. There are a few boutiques in Paris – remember me discovering the first one in the 16th, just off rue de Passy? Each Merveilleux meringue cake comes in large, individual or mini, and each take a theme from French society. 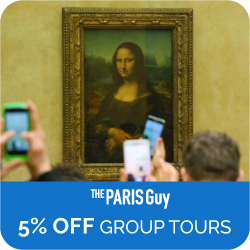 Choose your size, for example, with a whipped cream and caramel that’s called the Sans-Culottes – meaning “without breeches or pants” – referring to the common people who largely took part in the French Revolution. Cinnamon lovers will enjoy the Incroyables (cinnamon speculoos cream), or why not try the Unthinkable (the Impensable) with its crispy creamy coffee meringue? For a cherry in your cake, go Excentrique. Don’t forget to stock up for an extra-sticky brioche breakfast of Cramiques, either studded with traditional raisins, sticky “plain” sugar, or with dense, dark chocolate chips. Award-winning pastry chef, Sadaharu Aoki has been amazing Parisians with his distinct Japanese influences on French pâtisserie for the past 20 years. The window is enticing enough with Matcha Green Tea croissants and colorful macarons but why not step inside to taste the yuzu citrus and the black sesame macarons in the tranquil tearoom? Many macarons are tea-infused with Hojicha grilled Japanese tea, and Genmaïcha, a green tea combined with roasted brown rice. Green tea is given another voice with his popular pastry, the Bamboo – Chef Aoki’s Japanese take on the classic Parisian Opera cake, with each delicate layer consisting of joconde biscuit, buttercream, chocolate ganache, syrup and glaçage (glaze) – but in place of the traditional coffee syrup, chef Aoki exchanges it with Matcha green tea and a splash of Kirsch liqueur, adding that special je ne sais quoi to the opera notes – Yo, it has its own pentatonic scale! For more of his pastry tastings, see my previous post here. The shop was previously teamed up with Jean Millet Paris until May 2017. 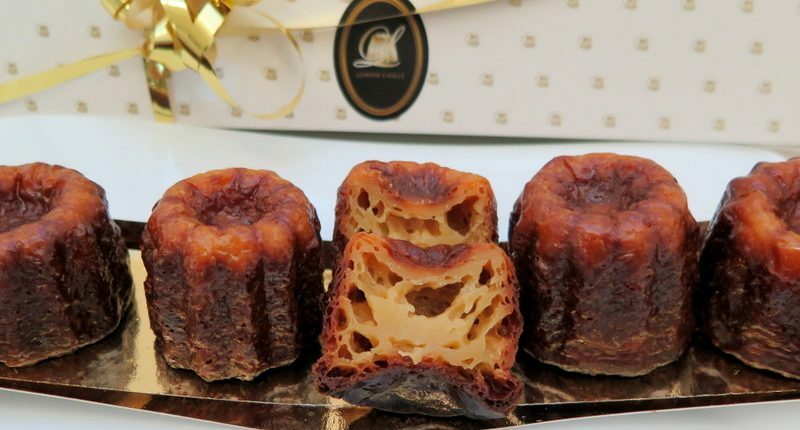 Stop here for a taste of the other speciality of Bordeaux, the Canelé. As winemakers used egg whites to clarify their wines, the local nuns came up with this delicious idea to use up the egg yolks in the 18th Century and the Canelas was born. Over the years the name has changed but it’s still a fascinating little caramelised crunchy fluted cake with an eggy vanilla and rum interior. They also have macarons and chocolate but you can’t leave France without tasting a Canelé! The good news is that they can keep for a few days, so prepare your doggy bag for later as there are still many treats to try yet. If you’re looking for a good, crusty baguette and a choice of delicious sliced breads, pop into the Boulangerie Nelly Julien, 85 rue Saint Dominique and be tempted with even more pastries. 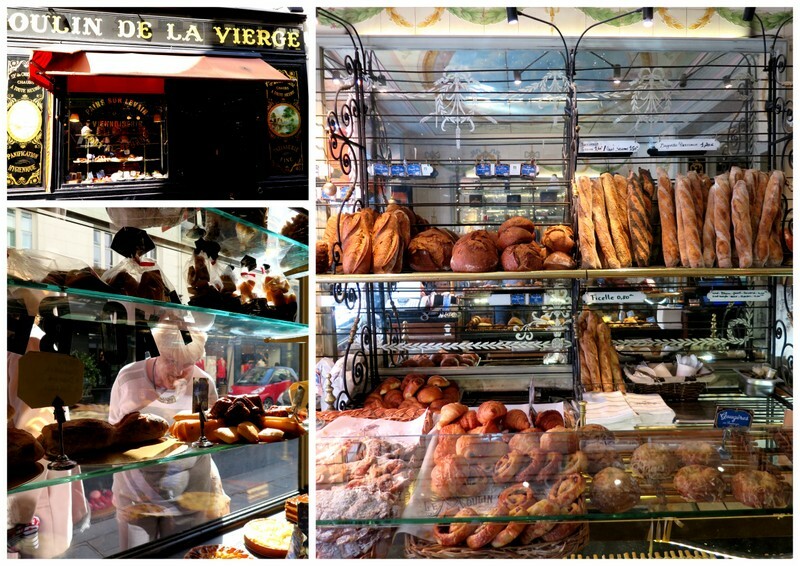 The bakery window says it all: “Viennoiserie – Tout Au Beurre”. 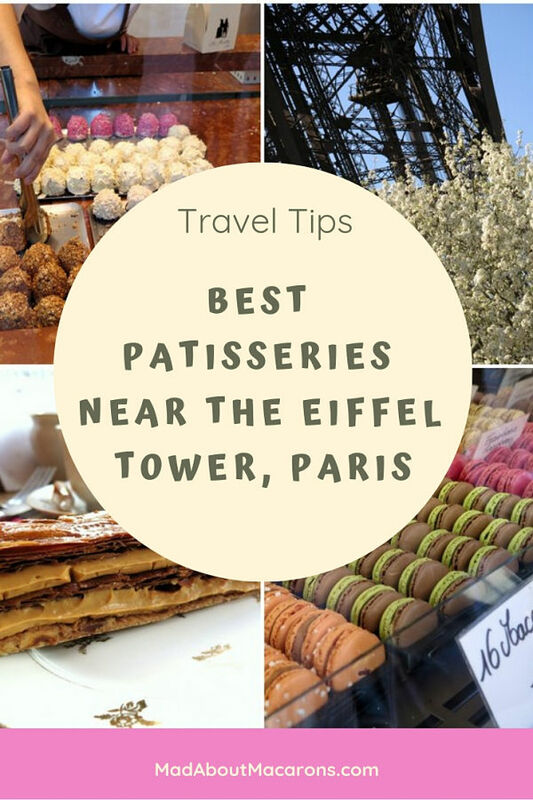 Here you have to taste their Viennoiseries, the delicious umbrella word which covers the best buttery, flaky croissants, pains au chocolat, pains au raisin, apple chaussons to name a few – and typically eaten for breakfast. More butter cakes come in the form of little Financiers (friands) teacakes, plus their selection of traditional pastries. Rows of fresh crusty bread, flutes and baguettes wink at customers behind the cosy lamps on the counter. They also offer soup and sandwiches to either take out or sit in. Turn right into Rue Amélie and you’ll see why it’s worth just a few steps off rue Saint Dominique. Decked out in turquoise blue and white, you’ll love the array of patisseries, macarons and viennoiseries dreamed up by talented pastry chef, Francesca and her team. Check out the chic Parisian wallpaper and flowerpots on the original steel frames kept to remind you of the location’s history: it housed the workers of the Eiffel Tower in the 19th Century. You’ll also be lured in to watch the chefs in full swing producing their picture perfect pastries and brioches from the lab in full view behind the counter. Pastry classes on request. As the word, “Thoumieux” implies with its play on French words, everything’s better! 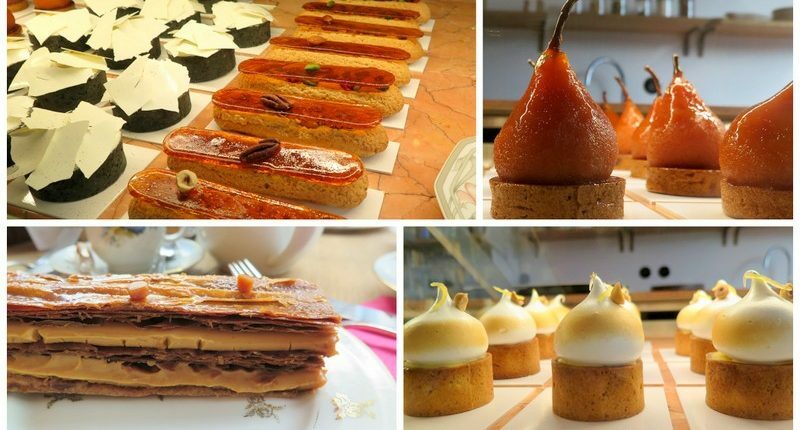 Just across the road from Chef Jean-François Piège’s famous eponymous brasserie, his cake shop has been taking Paris by storm since 2013 with the famous Chou Chou (a chou bun with a mini chou hidden inside). Pastry chefs Sylvestre Wahid and Alex Lecoffre play with seasonal inspiration to create artistic treats using natural sugars and honey as well as some gluten free options. You’ll love their fraisier, mango cheesecake or lemon cake with a white chocolate crust. Don’t miss their fresh brioche buns – although my firm favourite still has to be the Chou Chou, which comes in various seasonal combinations. 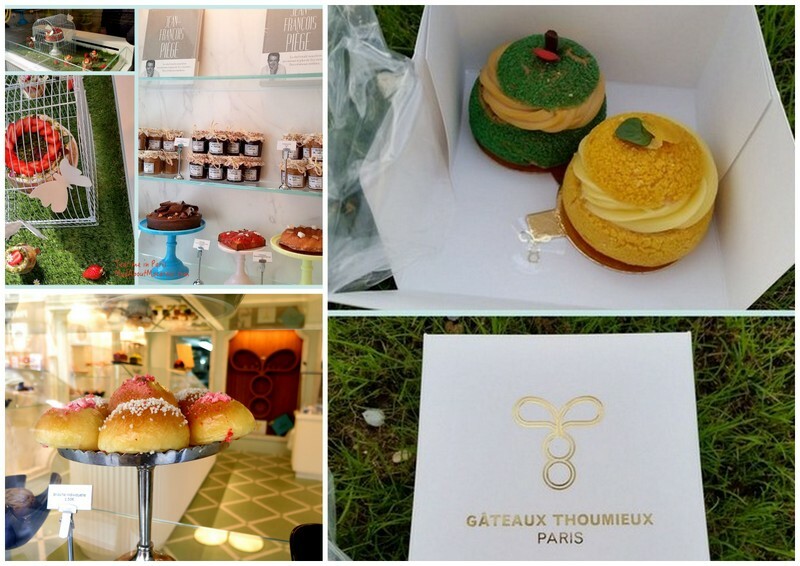 Update: Since writing this post, Thoumieux have sadly closed down their patisserie but the chocolates and macarons continue with a new shop opened by pastry chef, David Liébaux since mid-October 2017.
Who would have known that salted caramel is a recent discovery? 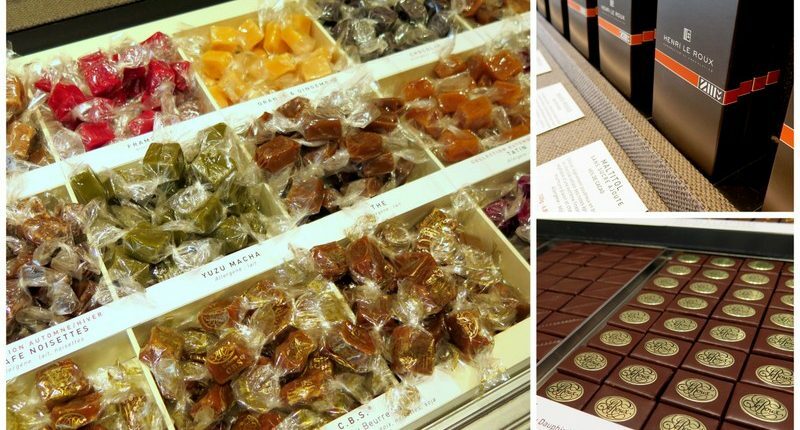 Not only is this one of the top chocolate shops in Paris but Henri Le Roux is also known as Caramélier. Fans of salted caramel have Henri Le Roux to thank, as he created the CBS© (Caramel au Beurre Salé) in 1977 in Quiberon, the location of his first chocolate shop in Brittany and where salted butter is added to many local specialities. Ever since, salted caramel has appeared the world over and so he wisely registered it in 1981. Don’t leave Paris without a taste of the CBS, with its deliciously dark and soft half-salted caramel with crushed walnuts, hazelnuts and almonds giving it such a unique texture – and now celebrating its 40th birthday! There are dozens of additional flavours to choose from, including a subtle Sakura cherry blossom caramel to welcome the arrival of Spring. Peruse the mouth-watering range of chocolates (including one with truffle), as well as the caramel (Caramelier) and chocolate (Bonsoncoeur) spreads that are a special luxury on crêpes or simply on the best baguette! Stick with me, as caramel continues to unwrap at the next block! Karamel is the new concept tearoom and patisserie created by another caramel-loving Breton, Nicolas Haelewyn, after a career at Ladurée with the last 5 years as international pastry chef. 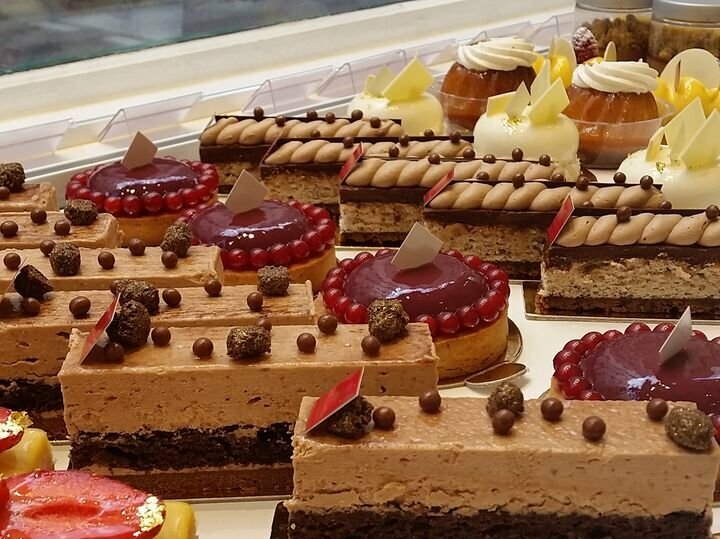 Sitting in front of a long glass case of traditional looking pastries, it’s difficult to choose just one, as each masterpiece is intriguing – from the giant 1001 Karamel Mille feuille to some more dainty-looking treats. While I’m pondering, I’m thrown off track with tasting cups of a huge tureen of Teurgoule (or Terrinée), a dark-skinned slow-cooked caramel rice pudding from Normandy as Mum and our good friend, Rena, already tuck in to their pastry choices. I won’t spoil your surprise of my rather curvy caramelised pear on a tartlet – but open it up and Oh-là-làs are guaranteed! Sharing this somehow would have been difficult (well, that’s my excuse). The teas by Kodama are all beautifully explained. Amazed at such a surprising match of green tea with lively ginger and lemon, the extra touch was a caramel slipped behind a dainty floral porcelain teacup. Want to make your own financiers, canelés, madeleines, tarts, millefeuilles, éclairs, choux buns and macarons yourself at home? 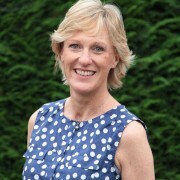 Don’t forget you’ll find the recipes in my second book, Teatime in Paris!